Loyola University Maryland packs a lot of positives into a small, friendly campus! With 4000 undergraduates, it’s not small, but classes are capped at 35 students. All freshmen participate in the first-year “Messina” program, in which a professor serves as the academic advisor for a class of about 15 students, who often live in the same living-learning community, as they experience a year-long seminar style course together. Loyola students say their Messina experience builds close relationships with professors and with their “Evergreen” peer mentors. Loyola University Maryland has thirty undergraduate majors in three academic colleges: Loyola College of Arts & Sciences, Sellinger School of Business, and the School of Education. Students apply to the university overall, not to a specific school, and students are able to take courses and/or choose majors and minors in any of the three colleges. Unlike many of its sister Jesuit institutions, Loyola Maryland offers several engineering majors. Loyola University Maryland students say that two of the hallmarks of their education are the close relationships with faculty, and Loyola’s strong encouragement to experiential learning. Over 60% of students Loyola students study abroad, and because of Loyola’s location in the city of Baltimore, students have internship opportunities with major US corporations, including sports franchises, financial services firms and other major industries. Baltimore is fourth in the nation for biotech, as well as a big college town – there are 13 colleges and 120,000 college students in the area, all connected by the Baltimore Collegetown shuttle network. Loyola University Maryland does have a core curriculum, which requires students to take a series of introductory courses across the liberal arts spectrum. Most students take the 15-17 core courses, which offer some choices and flexibility, over their 4 years. Students are required to take one Intro to Theology course; students can choose their additional required theology course from a large list of options. Chapel attendance is not required. Many students find new interests during the course of fulfilling their core requirements, and easily add a second major or minor while still being able to graduate in four years (Loyola Maryland is quite proud of their four-year graduation rate, which is 79% – significantly higher than the national average.). Loyola is definitely a residential campus – most freshmen live on campus and 81% of students live on campus all four years. The campus is exactly what you expect a college campus to look like – an academic quad with dining halls on either side. Loyola shares its library with the neighboring Notre Dame of Maryland University, but the two are not connected in any other way. Additionally, while Loyola shares its name with three other Loyola-named universities – in Chicago, New Orleans and Loyola Marymount in Los Angeles – these universities share a foundation, but each is operated independently. Loyola is test-optional, and does not even require test scores in their merit aid calculations. Merit aid is directly connected to GPA, and most students with a 3.3 (weighted, academic GPA) are offered some merit aid. Loyola does require students who do not submit test scores to submit either an additional essay or an additional teacher recommendation. 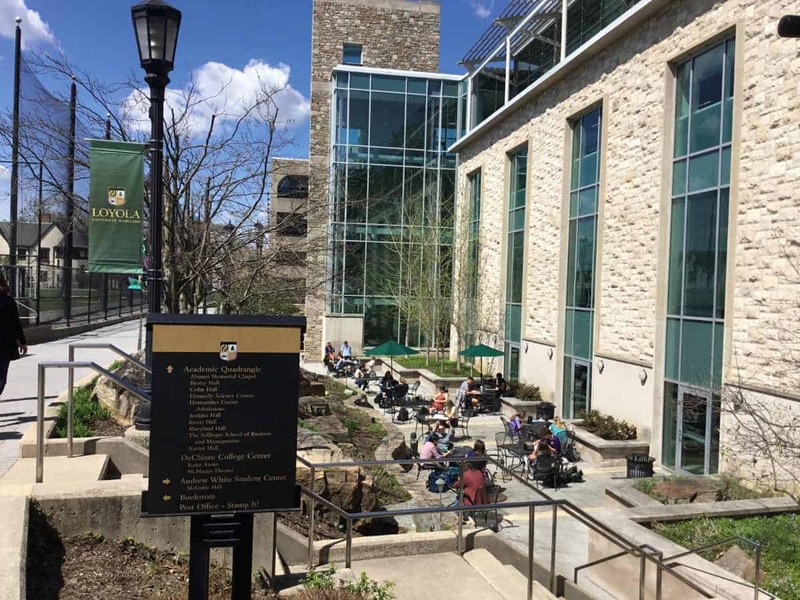 Overall, Loyola Maryland offers students all the benefits of a traditional residential campus, with the additional benefit of a big city location. With Division 1 sports, a beautiful college town campus, and a strong connection between students and faculty, Loyola Maryland is exactly what many students seek in their college experience. Evelyn visited Loyola University Maryland in spring, 2019. You can scroll through all of the photos from her visit below.